(Nanowerk News) What use is a hand without nerves, that can't tell what it's holding? A hand that lifts a can of soda to your lips, but inadvertently tips or crushes it in the process? “Despite decades of research, tactile sensing hasn’t moved into general use because it’s been expensive and fragile," explains co-creator Leif Jentoft, a graduate student at SEAS. "It normally costs about $16,000, give or take, to put tactile sensing on a research robot hand. That’s really limited where people can use it. The traditional technology also uses very specialized construction techniques, which can slow down your work. Now, Takktile changes that because it's based on much simpler and cheaper fabrication methods." TakkTile takes an existing device—a tiny barometer, which senses air pressure—and adds a layer of vacuum-sealed rubber to it, protecting it from as much as 25 pounds of direct pressure. Jentoft and co-creator Yaroslav Tenzer, a postdoctoral fellow, say that the chips can even survive a strike from a hammer or a baseball bat. At the same time, Takktile is sensitive enough to detect a very slight touch. The result, when added to a mechanical hand, is a robot that knows what it's touching. It can pick up a balloon without popping it. It can pick up a key and use it to unlock a door. 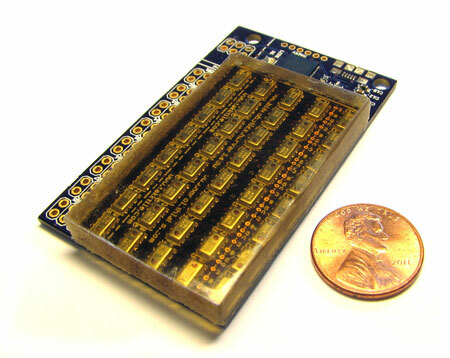 Beyond robotics, Jentoft and Tenzer suggest that the TakkTile sensor could be used in a range of electronic devices. A toy manufacturer could make a stuffed puppy that responds to petting; a medical device designer could create a laparoscopic gripper that's gentle enough to tease apart tissue during surgery. Along with their adviser, Robert D. Howe, Abbott and James Lawrence Professor of Engineering at SEAS, Jentoft and Tenzer are pursuing commercial opportunities with help from Harvard's Office of Technology Development. Harvard plans to license the technology to companies interested in offering prefabricated sensors or in integrating TakkTile sensing into products such as robots, consumer devices, and industrial products.